Holy freholy was 7/11 busy, I saw at least three sets of teens driving in to score free slurpees as well as a few other folks. There was one particular set of... "hyper individuals" who may or may not have hit my car with their truck door, sat at a green light and laughed while people honked at them, and then ripped down the street only to wind up flying through some other lights across town and then trespassing down a highway department road several minutes later. This was just one example of several horrendous drivers I saw in the span of 15 minutes. Is it a full blue harvest super moon today or something? Oy. Anyway, here's my Strawberry Lemonshade Slurpee, and to be honest, it's not that bad. The last several slurpees kind of had this funky generic all taste the same vibe going on, but this one is different. The "strawberry" provides a sweet base while the "lemonshade" provides a big kick and it worked for me. 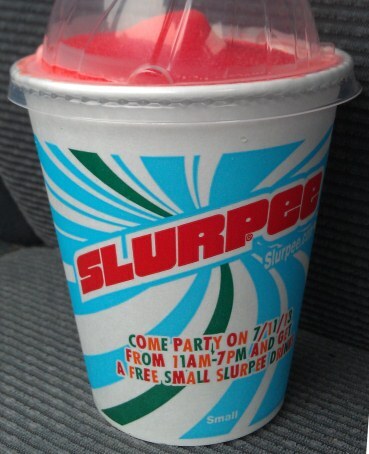 There no strawberry or lemonade bits, but for a slurpee, it was fun. I finally felt like I was having something unique, not just another hodgepodge of artificial flavorings. You might want to rinse the red food coloring out of your mouth before returning to work.